Visualizing things you want to explain is now possible and can be done remotely. We’ll explain, why: we have submitted our SkyRemote app to the newly-opened Skype App Directory! SkyRemote is just the first fruit and we have chosen it for one simple reason: it is a sure-fire solution for a wide range of users who need to share their desktops with other users on their contact list! Desktop sharing with SkyRemote is secure, free and easy. 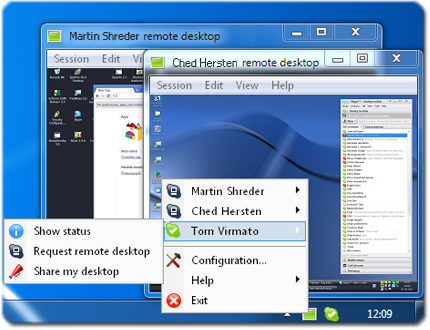 Multiple desktop sharing, controlling a remote desktop, recording sessions to AVI files, remote clipboard access – these are just some of the killer features provided by this app. 10MB of free disk space at system drive. The app is well-documented: you can find a detailed manual and make use of the integrated help file. Check out Skype App Directory for our new Skype app soon! June 29, 2011 From Grails 1.4 to Grails 2.0: Strategic Upshift September 26, 2011 Happy Birthday to You, SCAND!